Make your own natural disinfectant for home with safe, non-toxic, inexpensive household products! Get your house as clean and disinfected as you would with store bought products with this simple lemon disinfectant! This natural disinfectant is one of my best buddies, always on hand and totally reliable! My house is nowhere as clean as I would love it to be or as one might be thinking it truly is (I do project myself as a cleaning freak but truth is, I’m a total mess! I’m just very good at pretending lol). I barely have time to clean my house properly (and to me that means deep cleaning the heck out of every nook and cranny!). I normally do an extensive clean up once a week and a deep clean once a month, but I totally rely on the touch ups I do here and there using my homemade natural disinfectant, whenever I spot something that doesn’t seem quite clean. I love using this home disinfectant to remove germs and bacteria, every time I finish using my kitchen counter. I also use my handy dandy homemade disinfectant spray to clean my cutting boards (which smell super yuk especially after cutting meat, fish, onions and garlic). This natural disinfectant spray is an awesome help in the bathroom too, for sinks and tubs and even in the fridge to help eliminate odors. I sweat to you, my natural disinfectant is such an amazing product and it only takes minutes to make so I’m never out of it! And it’s so convenient! 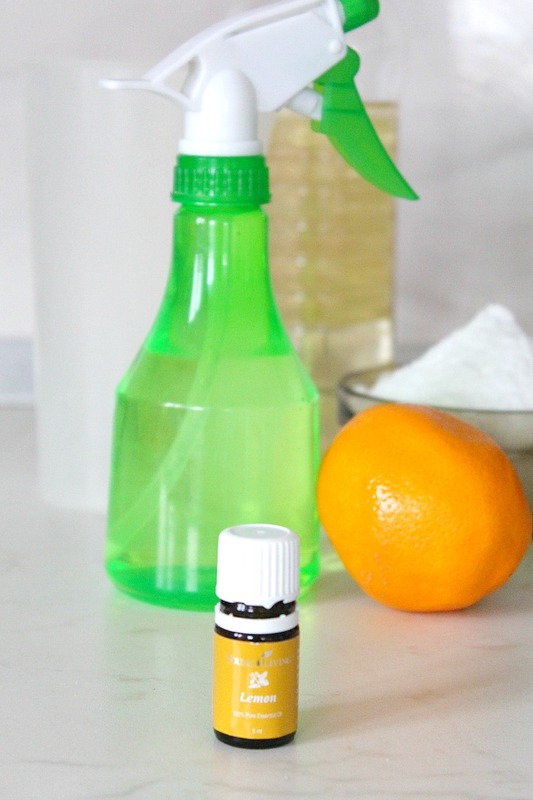 My natural disinfectant uses household ingredients I always have in the house and chances are you do too, it’s affordable, inexpensive and non-toxic, making this lemon disinfectant a much better choice for the environment than the store bought products. 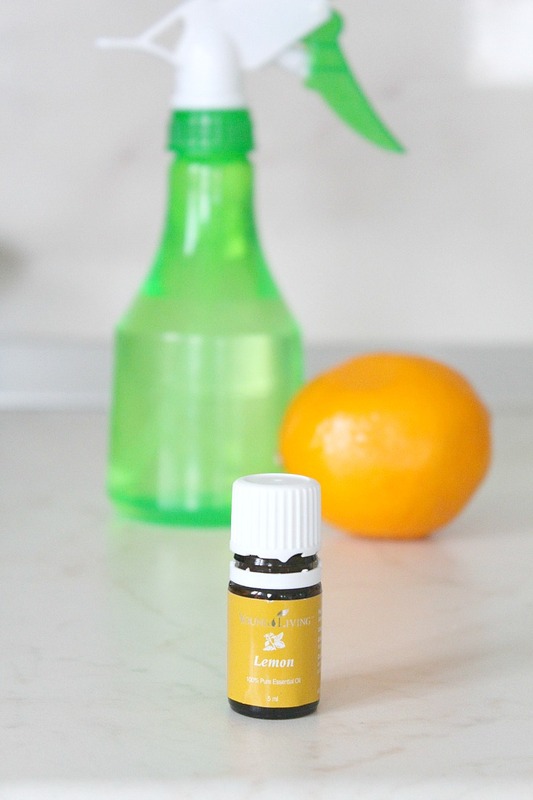 I love adding lemon essential oils for extra cleaning strength and for that wonderful scent. It’s just so beautiful and fresh! OMG I am sorry but I cannot stand how man pop up ads come up on your site! I have one every few seconds and cant even get to your post easily with out closing a million windows! I’m sorry to bring you bad news but it seems like you have a virus in your computer. If you’re reading my blog on a desktop, there’s just one pop up, to my newsletter, which you can easily ignore by just clicking out. If you’re reading it on mobile, there’s no popup whatsoever. Hi Katrine. Thanks, I appreciate it. Don’t get me wrong, I know you had good intentions, but specifying all the details, like the ingredients and the method doesn’t give your readers any reason to click back to the page where the original tutorial is. The practice is to mention the name of the product, maybe a couple of ingredients without the exact measurements and then link back to the original project. This is a win/win for both sides and that’s what myself and my circle of bloggy friends have been doing for years. Have a wonderful weekend and I hope your little boy feel better soon! I love using vinegar and baking soda and now lemon. Stumbled!